The provision of cesspits in the houses of the capital was made compulsory by an Arrêt of the Parlement of Paris at the surprisingly early date of 1533. In 1777 a survey found their existence all but universal; often cesspits were shared between several adjacent proprietors, either dug out immediately at ground level, usually in courtyards, or under basements - the standard rates for emptying differed accordingly. Regulations demanded retaining walls of at least a foot in thickness; they were generally tiled or provided with clay lining, though the problem of leaching was not successfully addressed until the 19th century. The vidangeurs, cesspit emptiers, usually worked by night. They sometimes just skimmed off the liquid at the top of the cesspit using a system of ladles, buckets, and pulleys, but periodically they were obliged to descend right down into the pits to remove encrusted solid matter with shovels. Due to the inefficiency of fluid retention 18th-century cesspits needed emptying less frequently than those of later years; the great 19th-century hygienist Parent du Châtelet observed that in 1835 cesspits often had to be cleaned once or twice annually whereas in the 18th century the larger pits were cleaned out only once every eight or ten years. Unfortunately for the same reason the build up of noxious fumes was that much greater; the vidangeurs were usually obliged to work in irregular bursts because of the fetid conditions. The ordure then had to be taken by cart or trundled away in barrels, in theory all the way to the voirie at Montfaucon. Not surprisingly, given the conditions under which they laboured, the vidangeurs had a reputation for hard drinking, truculence and malpractice. Police played a cat-and-mouse game trying to catch them illegally dumping: much complain was caused by the use of pierced barrels or "lanternes" which allowed liquid waste to pour off conveniently into the gutter. Regulations promulgated in 1726 and succeeding years laid down in detail how the task was to be completed, including a strict prohibition on diverting to cabarets or eau-de-vie sellers. Despite their marginal status and frequent confrontations with authority, the cesspool workers were integrated into the guild structure of Paris. In 1776 there were thirty-six master vidangeurs, each of whom was required to produce a chef d'oeuvre (!) and pay a fee of one hundred francs. In 1729 the Parlement of Paris reaffirmed the master cesspool cleaners' monopoly of the trade in Paris. The guild also claimed the right to self-policing and appointed paid inspectors to enforce the rules. However, the occupation continued to attract penniless and inexperienced labourers who undermined the guild's control, often to the detriment of safe practice. ......an operation so important and at the same time so dangerous as that of emptying privies, should not be left to chance. On this operation depends the health and the lives of men, and principally of that class who undertake it: a class so useful, and yet so despised: whose functions are so revolting against nature, and the imminent perils of which render it so deplorable; in fine, a class who hazard their lives to preserve the lives of others, and are exposed every instant to the risk of finding a grave in their laboratory. How mortifying it is to hear it coolly remarked afterwards, that this class is only composed of porters, accustomed to sell the strength of their shoulders to their fellow citizens, an inhuman and contemptible reflection, which none but base and savage minds could be capable of making; it would be more difficult to change them, than to neutralise the most fetid mass of corruption. The most practical measure suggested to improve the lot of the cesspit cleaner was the use of a "ventilateur". This device was an airtight structure placed over the entrance to the cesspit, with bellows fitted to force the stagnant air out into the street. 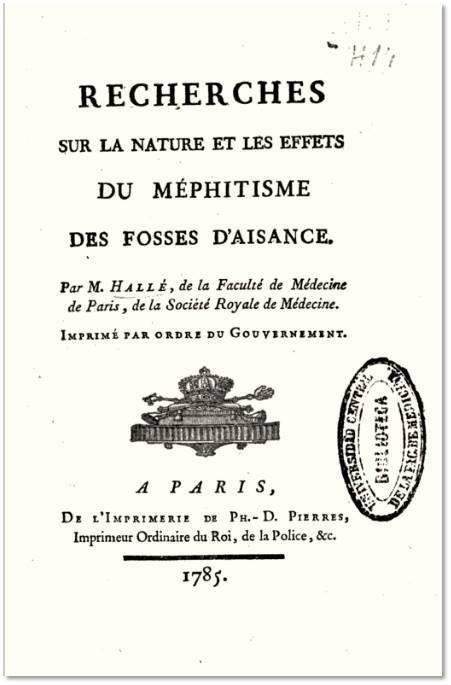 Its application was advocated in a paper entitled Observations sur les fosses d'aisance, read and approved by the Academy of Sciences in 1777 and subsequently published as a pamphlet. 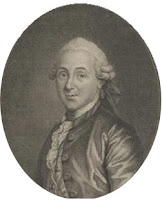 The authors were Louis-Guillaume Laborie, a member of the College of Pharmacists, Antoine-Alexis Cadet de Vaux (1743-1828) and his associate Antoine-Augustin Parmentier (1737-1813). 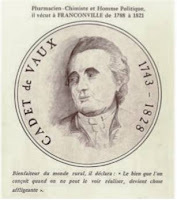 Cadet de Vaux was a reformer with a gift for publicity, who in 1777 founded the highly successful Journal de Paris to promote his ideas. (In the Revolutionary years he was to be behind the celebrated clearance of the Cimetière des Innocents) The ventilator was not a new invention - privileges had been issued for its use in the 1760s - but the Observations added refinements; the use of quicklime as a disinfectant and the addition of a furnace to encourage the movement and dispersal of gases. Under the patronage of Lenoir, radical steps were now taken to put the idea into practice. In 1779 a Société du ventilateur was formed with Cadet de Vaux and his father-in-law Charles Delaplace among its associates. Royal letters patent awarded the new company exclusive rights to empty the cesspits of Paris. The guild of vidangeurs was simply swept aside, its members displaced or reduced to employees of the company. (Exact timing is a little confused: Reid puts this initiative in 1776 in the context of Turgot's reforms but the Journal de Paris has a notice with a date of 11th May 1779). The enlightened reformers laid down exactingly high standards of cleanliness, capped with a proud declaration that all cesspits would henceforth be emptied by day. Prices were set at 65 livres per toise for pits on the ground floor and 70 livres for those in cellars. In the event, however, the venture was shortlived. The costs, passed on to disgruntled consumers, proved too high; after a few years, the company was disbanded and the guild reinstated. 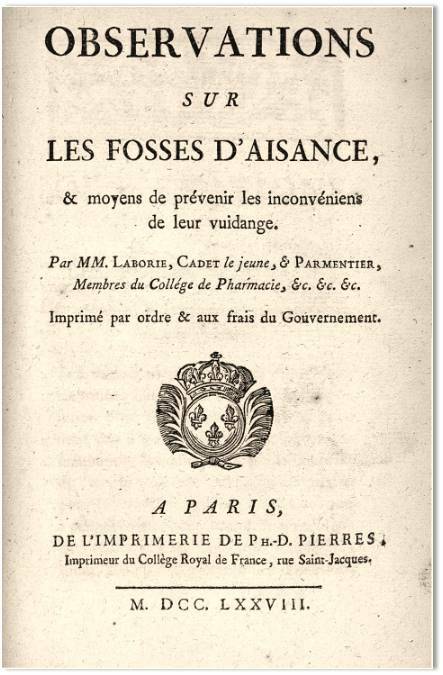 Observations sur les fosses d'aisance, et moyens de prévenir des inconvéniens de leur vidange, Paris 1778. 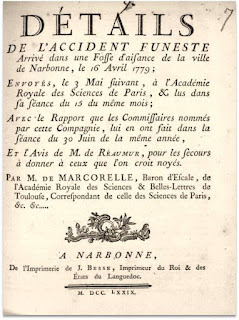 This incident was the subject of a report by Jean-François de Marcorelle, baron d'Escale (d.1787), a keen local mathematician and scientist and corresponding member of the Parisian Royal Academy of Sciences. His paper was read to the Academy and subsequently published. He went on to write an Avis pour neutraliser à peu de frais les fosses d'aisance (in the English version, "Advice for neutralising necessary houses at a small expense" ) This second work was sharply criticised in the Journal de Paris for advocating the use of quicklime or whitewash ("chaux vive" / "lait de chaux"), already put forward in the Observations of Laborie, Cadet de Vaux and Parmentier. The accident, which claimed the lives of three workmen and five rescuers, occurred on 16th April 1779 in a large house near the old town walls of Narbonne known as Le Luxembourg after an inn which once occupied the building. The owner, an pharmacist named Faure, had let the accommodation to a large number of different tenants, all of whom were employed in noxious trades: anatomical demonstrations took place in one room, silk manufacturers occupied the ground floor, whilst the basement was given over to the production of verdigris. The whole building was served by a single cesspit situated in the second of two courtyards. It was eleven-and-a-half feet by six feet, nine feet deep and covered with a slanting roof. This monster received not only excrement from the entire household, but silk cocoons, anatomical debris, sediment from the verdigris and a host of "other substances likely to produce infected, dangerous, murderous vapours which would poison those who breath them". Despite M. Faure's entreaties, local vidangeurs had refused point blank to empty it. M. Faure finally decided that there was no other solution but to have a second cesspit dug. It was then that disaster struck. "By the saddest of fates", comments Marcorelle, "the means he employed to avoid death in the first cesspit brought him death in the second." On morning of 16 April construction was well under way when suddenly the retaining wall between the two pits dramatically collapsed and a "mephistic torrent" poured into the new pit. The builder and his assistant, a girl of 18 years, who were working in the new pit were instantly overwhelmed. Two workmen were dislodged from the scaffolding. One fell into the pit. The son of the second came to his father's rescue and he too fell in and drowned. A wool merchant who tried heroically to rescue the unfortunate builders was also overcome. At this point M. Faure himself went down and was asphyxiated, as were two other passing tradesmen who followed. Finally M. Faure's two young nephews succeeded in bringing up their uncle and the builder. A 31 year-old former grenadier pulled out the others. All eight were pronounced beyond help. Marcorelle is scathing about the medical treatment they received. though he at first revived, M. Faure himself eventually succumbed under the onslaught of repeated bleedings in a sealed room. Only the builder survived both the cesspit and the attention of the doctors. Marcorelle finishes his account by reproducing a royal edict of 1740 based on the researches of Réamur, which offered rather more intelligent advice on how to deal with drowning - warming the victims, moving their limbs, blowing warm air into their lungs. 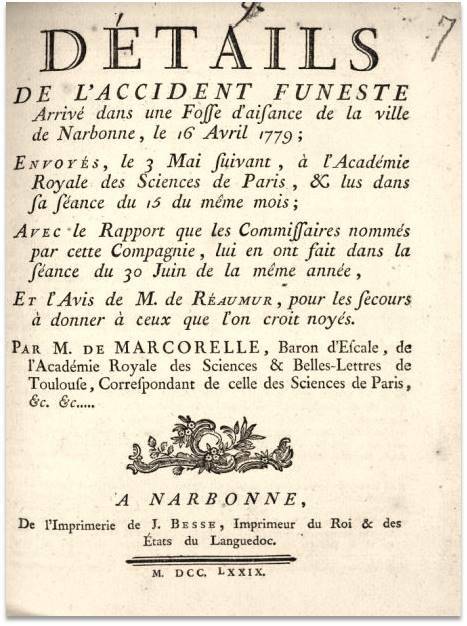 Détails de l'accident funeste arrivé dans une Fosse d'aisance de la ville de Narbonne, le 16 Avril 1779. Read to the Académie des Sciences in Paris on 3rd May. Avis pour neutraliser à peu de frais les fosses d'aisance, afin d'en faire la vidange sans inconvénient & sans danger, Narbonne : J. Besse, 1782, in-12, with parallel English text. Jean-Christophe Sanchez "Les travaux de Jean-François Marcorelle, académicien des Lumières" (Presentation) November 2014. On 23rd March 1782 experts gathered in front of the Hôtel de la Grenade in the rue de la Parcheminerie to witness the cleansing of a cesspit. Among the dignitaries of the Academy of Sciences were Lavoisier, Le Roy and Fougeroux. Also present were five members of the Royal Society of Medicine, the chemists Macquer and Fourcroy, the duc de la Rochefoucauld,the abbé Tessier, and Hallé himself. Their objective was to put to the test the antimephitic properties of vinegar advocated by the Lyonnais opthalmologist Jean Janin de Combe Blanche. The landlady was certain that medical students had added to the occasion by burying arms, legs and other body parts beneath the excrement. In fact Verville soon recovered but remained convinced that "cesspool gases that have been transmitted" were even more noxious than those which have asphyxiated the unfortunate workman.